This year, the economy of the Eurozone will shrink, the governor of Austrian National Bank says. Austria suffers from a weak domestic consumption, Nowotny explains. 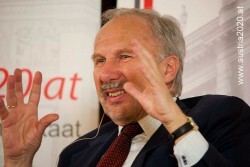 According to Ewald Nowotny, the Eurozone will not leave the recession behind in 2013. In an interview with “Vorarlberger Nachrichten”, Nowotny said that the negative development will continue. He expects a growth rate of 0.3% this year.